Very nice and high quality box. The box is solid wood and feels great. Had a name engraved on the metal plate on top. Used it to present a necklace as a gift. The velvet pad inside is double sided. One side has two elastic bands for earings or cufflinks and the other side has longer single elatic band for pendant, necklace, money clip or a watch. Depending on the type of gift contents you can select either side of the pad. 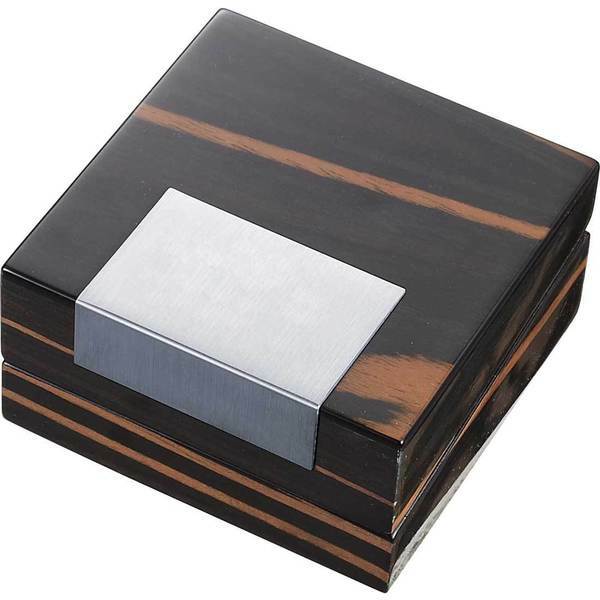 Luxurious Exotic Wood Exterior with Premium Quality Stainless Steel Engraving Plate and Tan Suede Lined Interior that is Perfect to Hold Cufflinks, Lighters, Money Clips, or Any Other Jewelry. Comes Packaged in a Cardboard Box that is Easy to Gift Wrap. Perfect to Store Gifts Like Jewelry or Cufflinks and the Box Itself is a Memorable Gift. Love this box. It can be used for many different items. The wood is beUtiful!! Love the colors and the shiny laquered finish. The inside is soft and will protect your jewelry. Great purchase . Great gift too! Well made, heavy, durable and beautiful. I used this to gift a keychain and it was just as much of a gift in and of itself! The recipient loved it.